Our family coordinator called us yesterday morning at 8am with news of our referral. ”Your wait is over” she said : ) We cried as we listened to the story of our baby boy’s 11 months of life unfold over the phone. ’This is his story’, I kept thinking, ‘this is the story we will be telling him as he grows up!’ It was absolutely surreal. Then came the e-mail, and the pictures! Our coordinator told us over the phone “He has a round head and almond shaped eyes, he is so beautiful! ”. And he is, he is just the most beautiful thing I’ve ever seen. We called family, we went on a long walk with our dog. We went out to lunch. Everything changed in a matter of hours. Our hearts have room for one more real little person, the third member of our family, and we have been waiting for him for so, so long. 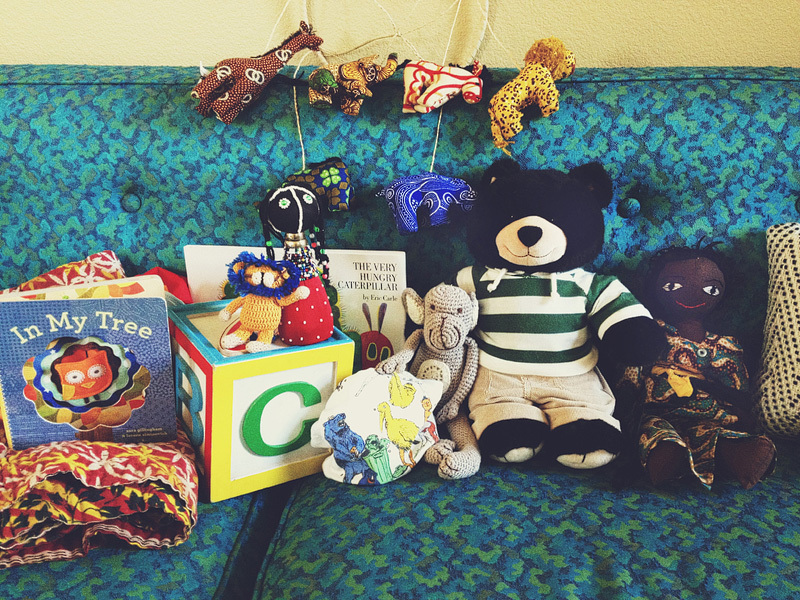 Today I piled a bunch of things you have all given us on our blue couch upstairs. I am overwhelmed by the love that has been shared with us for this little guy over the past 2 and a half years. We have been through a long wait, and you have all waited with us. We can’t begin to thank you for your prayers, your encouraging thoughts toward us, your financial support. We have a very loving family of friends and relatives walking through this with us and we couldn’t have asked for more. In fact, I am so excited to tell you all about our little one because I know you are all just as excited to bring him home!! Thank you for sharing in that with us! That being said, we are back in the same boat of uncertain time frames and forward steps. We will take this one thing at a time and hope to bring our baby home within about 4 or 5 months. There will be a 2-3 month period RIGHT NOW that we will have to wait to fly over there for the first time. We will more than likely be in the dark on when exactly we will fly to Ethiopia for the first time until just over a week before we do!! So, here’s to more patient waiting! Once we fly over it will be another 2 months or so before we can fly back for the second time to pick up our son. While it will be hard to wait because of the uncertainty of the time frame, we are excited to finally get to start preparing for his arrival. I CAN’T BELIEVE IT! God is so very good! We love our little guy!!!! He’s coming home soon!!! (P.P.S. Ed wants me to make it clear that these are not the words he would use to describe this situation, but they do capture his heart, in a general and less masculine sort of way). i cried while i read this. he sounds just beautiful. i cannot wait to meet him!!!!!! Isn’t it just the most mind blowing/amazing thing to see your son’s face, know the beginning of his life’s story, and dream of what is to come….. AHHHHHHHH!!!! I can’t stop thinking of how much God is smiling down on his perfect timing & blessings for the Grover Family. AHHHHHHHH!!! it’s too much for my heart to take…. I can’t stop smiling!!!! ps. I fully expect to see the angel mural from your inserted family portrait painted on your son’s nursery wall. I cried so many tears of joy for you reading this. So so so happy for you! Congratulations! I’m so happy for you and Eddie. So so happy. Can’t wait to meet him. Blessings all around! We are sooooo excited and praise God with you AND it came on the same weekend that we got to share Doug and Megan’s news, too! Sisters and babies…..what a blessing! Hallelujah!!! I was just praying for you guys this week during this wait time! I’m SOOOOOOOOOO excited for you, and we will continue to pray! What absolutely joyous news! Congratulations Grover family. I am so excited for you and the day that you first hold him in your arms. WOOOOHOOOO!!!! That’s AWESOME!! CONGRATS!! So happy for the three of you!! Can.not.wait. to meet your little guy!! Much love and continued prayers!! !